Calling loved ones who live overseas and staying in touch while travelling is an all-important issue as moving around the globe becomes cheaper and easier. Vaya offer low-cost plans with a range of options for travellers. 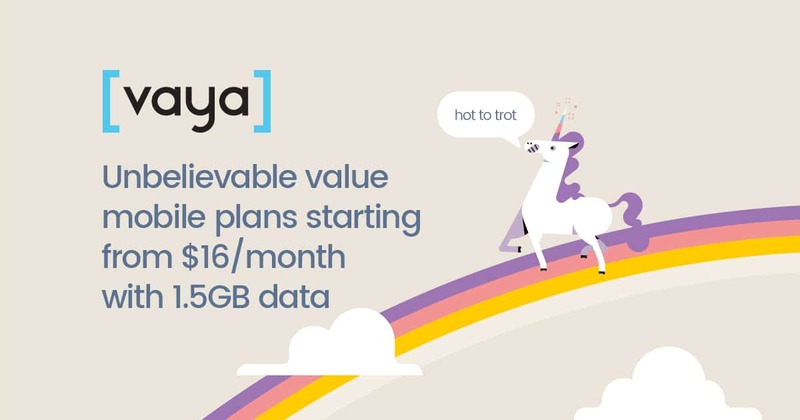 Vaya are an online-only mobile company with cheap plans for calling within Australia. Vaya mobile plans are SIM-only and offer unlimited talk and text with data as the main difference in price point. Using the Optus 4G network, 98% of Australians have access to this low-cost Mobile Virtual Network Operator’s rates. Global roaming used to be an essential plan feature, but modern technology such as widely available Wi-Fi and SIM cards dedicated to cheap international roaming make it less competitive than other options. Vaya has done away with global roaming altogether, instead suggesting its customers look into purchasing a local SIM. Up until the 1st February 2016, Vaya offered global roaming services for its customers, who paid a $200 bond to use the roaming rates. Customers who had paid the bond and left global roaming switched on will still be able to use the service (although once roaming has been switched off, it cannot be activated again). Any new customers will have to look at other options. While you can’t use Vaya to call Australia when overseas, you can access Vaya mobile international rates to make calls to other countries. Vaya customers can use their usual phone service to call overseas, and the cost of their international calls will be added to their bill at the end of the month. The international rates are different depending on which country you wish to call. Rates start from as little as $0.02 cents per minute to countries like Singapore and the United States of America, whereas calling Antarctica will set you back $4.50 a minute. Rates to other countries will fall somewhere in between. To find out what it will cost you to make a call to someone in another country, look for the information on the Vaya mobile international rates webpage. Either scroll through the list of countries or search for the country you want to call. As well as what your phone call might cost, you can find out the calling code for the country you want. You’ll need your country code while dialling the foreign number – overseas calls are made by dialling a + followed by the country code, area code (if calling a landline) and then the phone number. If the phone number starts with a 0, leave it out when dialling. Standard international SMS will cost you $0.25, MMS $0.50 and video calls are $2.50 per minute if you wish to use Vaya’s international calls service. While global roaming has become a less popular feature, there are other choices that are cheaper and more accessible when travelling. Some companies offer SIM cards specifically designed for global roaming, with a similar concept to the now old-fashioned calling cards. Buying a foreign pre-paid SIM allows you to connect locally at local rates, without paying extra fees to your Australian-based company. A small amount of research before leaving for your destination should help you learn how to purchase the SIM and what your preferred overseas provider might be. With Wi-Fi so readily available in many countries, some travellers try to avoid using a mobile network at all. Online calling services, such as Skype or the voice calling option of Facebook Messenger, are free with a Wi-Fi connection. Services like Skype even offer the ability to call a mobile line over the internet, although it does carry an extra charge. Many people think of their mobile phone plan as the default way to communicate internationally, but there are other low-cost or free options for Vaya customers who plan to travel. Instead of SMS or MMS messages, consider using messaging services like Skype, Facebook Messenger, WhatsApp or Viber. These options only use a small amount of data from your Vaya mobile plan, or you can use them over a Wi-Fi connection. Video calls can also be made using these services, although to save money it’s a good idea to make sure you have a Wi-Fi connection as video calls can chew up a lot data. If you regularly contact people who live overseas, it might be worth paying extra for a Vaya mobile plan with more data instead of calling internationally using your phone service.